Aragorn and Gandalf walked together or sat speaking of their road and the perils they would meet; and they pondered the storied and figured maps and books of lore that were in the house of Elrond. Order your own copy of the Middle-earth Gamemat at your local retailer or online through our website today! Fantasy Flight Games is proud to announce the Middle-earth Gamemat, the perfect accessory for your adventures in The Lord of the Rings: Journeys in Middle-earth! 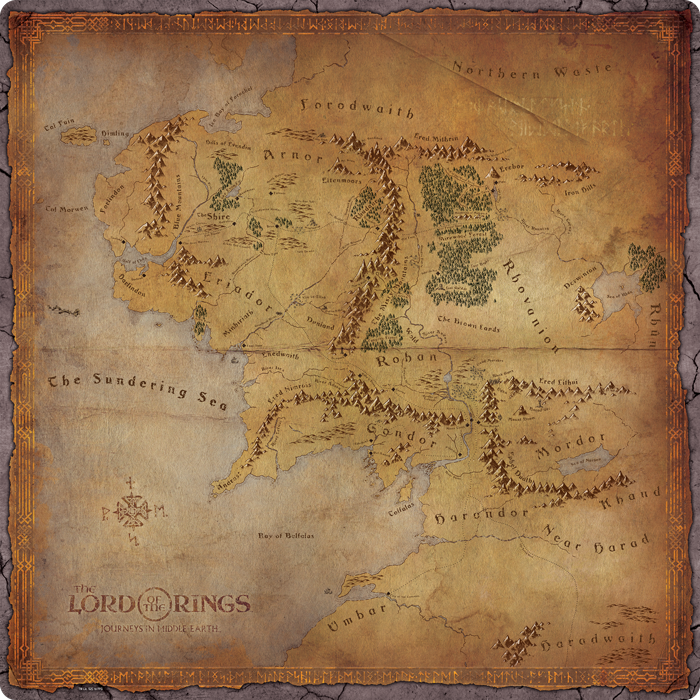 Your journeys could take you across the length and breadth of Middle-earth, from the northern wastes of Forodwaith to the deepest south of Harad. Whether you’re walking among the ancient kingdoms of Arnor, greeting the Horse-lords of the Riddermark, sailing the Bay of Belfalas, or approaching the city of Dale beneath the Lonely Mountain, this gamemat offers a beautifully detailed map of Middle-earth, picking out forests, rivers, mountain ranges, countries, and key locations. You can pre-order your own copy of the Middle-earth Gamemat (JME02) at your local retailer or online through our webstore today! Look for this gamemat to release in the second quarter of 2019.